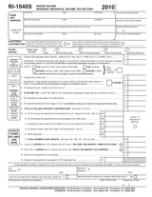 Form RI-1040S is the short version of Form RI-1040. Either Form 1040 or 1040S must be in all Rhode Island resident returns. Rhode Island residents may choose to file either Form 1040 or 1040S but if they choose to file 1040S they will be unable to do certain things such as claim income adjustments or factor in the AMT tax. Review both Form 1040 and 1040S to decide which form is best of you.